Eleven staunchly wait and pray. But till it comes they mean to stay. Will sweep them to they know not where. As they look up with stark surprise. Revealing fear deep in their eyes. And hover, having reached their aim. Surprise and fear remain no more. Their timid souls rise up and soar. In foreign tongues they do not know. Heedless of the costly strife. And more they could not bear to hear. The meaning of His words is clear. But He abides within them now. Their Lord and God has kept His vow. 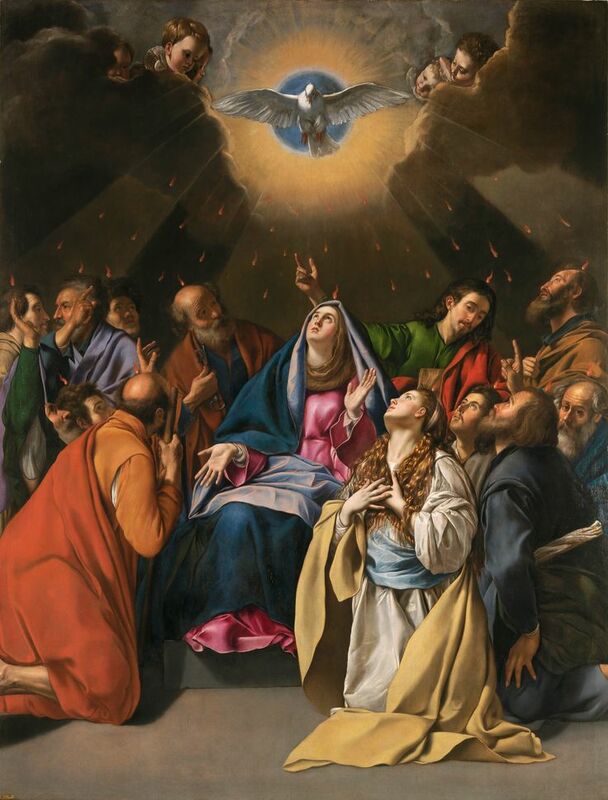 Thank you, Ellen Virginia, for this inspiring reflection on Pentacost, and the wind and fire of the Holy Spirit that transforms the fearful into men and women of courage and strength. I will always remember my own Confirmation day on Pentacost in 2008 at the glorious Mary, Our Queen Cathedral. I felt so enpowered by this grace of the sacrament that had been given to me as was annointed and sealed in the faith! I also remember this cute little girl who commented on my dress: “You look like a princess…like a valentine!” It’s was so adorable! Disciplined and beautiful – thank you!